Abundant sunshine. High around 95F. Winds NW at 5 to 10 mph..
Clear skies. Low 63F. Winds SSE at 5 to 10 mph. 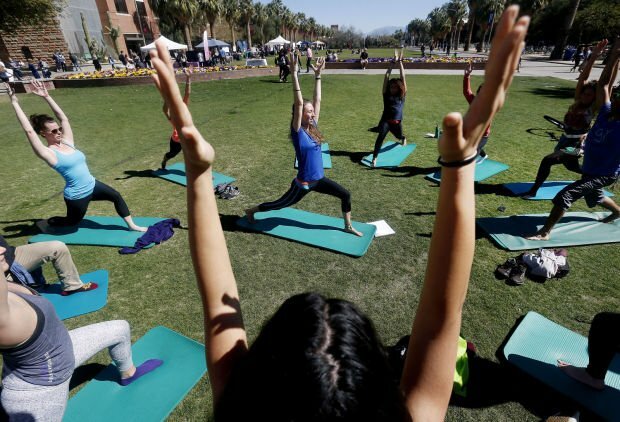 Phoebe Jenkins, center, leads a free yoga class with Campus Recreation's booth at the Body Smart health fair on the University of Arizona mall on Wednesday, Feb. 25, 2015, in Tucson, Ariz. Ten student groups and three sponsoring organizations had booths and displays at the fair that's mission is to "enhance self-image and positive body image among all students," said Gale Welter Coleman, Campus Health nutrition services coordinator. Tucson teens might be more susceptible to developing an eating disorder and less likely to get treatment, experts say. Arizona ranks second in the United States for teens who have purged as a method of weight control and has twice the incidence than the U.S. average, according to a recent study by the U.S. Centers for Disease Control and Prevention. The 2013 High School Youth Risk Behavior Survey found that almost 9 percent of high school students ages 14 to 18 in Arizona admitted to vomiting or using laxatives to lose or keep from gaining weight. The U.S. average was 4.4 percent. Sipp said that within different climates, there are various instances of eating disorder prevalence, but referred to a Temple University Department of Psychology study by Denise Sloan that found a higher instance of eating disorder pathology in hotter climates. Mental health crises, including eating disorders, tend to begin at the start of high school or college, Sipp said. Part of the problem people have in finding treatment when they’re ready to get it is that Arizona has a significant shortage of mental health providers and state-funded services, Sipp said. Sierra Tucson’s eating disorder program is for ages 18 and older, and Sipp said college students do check in for treatment. Anyone younger than 18 is usually referred to Rosewood, an eating-disorder treatment facility in the Phoenix area. The University of Arizona Campus Health Service is aware of the high incidence of eating disorders among students and has several programs for support and to help educate students. “Healthy Mind, Healthy Body” is a weekly support group on campus that focuses on a person’s beliefs and relationship with food and his or her body. Because of the stigma associated with the term “eating disorder,” a different name was selected. The major concern is that it could be a group gathered to “do their disease better,” she said. Although the group has been held weekly for years, turnout is typically low. Two years ago, Orlich and Gale Welter Coleman, coordinator of nutrition services, started a program called Body Smart that focuses on enhancing self-worth and positive body image. Body Smart also serves as a way to reach a wider audience than the eating disorder-specific groups. Although body image is a major factor in eating disorders, it’s a topic that people are more willing to discuss, Coleman said. The program consists of student-led workshops and discussions, either once a month or more frequently. Participants choose the topics they want to discuss, such as culture and the media’s role on body image and the impact of early sexualization. Last year, Campus Health conducted a survey gauging students’ beliefs and behaviors about their bodies. A little more than 1,000 students participated in the UA Healthy Bodies Study, and 63 percent acknowledged they’d had a strong desire to lose weight at least once in the past 28 days. Three percent of the respondents said they had a positive screening for a clinically significant eating disorder, but only 27 percent of them had received counseling or therapy in the last year. As part of National Eating Disorder Awareness Week, Campus Health held a Body Smart Fair on the UA Mall Wednesday, where student groups and outside organizations participated with booths, resources, surveys and yoga classes. For those who aren’t UA students, finding help for an eating disorder can be difficult, if private therapy or inpatient treatment isn’t an option. Southeastern Arizona Overeaters Anonymous offers free group meetings that could benefit people with eating disorders, but the group’s name is somewhat misleading. “It’s unfortunate about the name because people think we’re only about overeating,” said Beth, a member and group leader in Overeaters Anonymous. Although eating disorders and behaviors are all different, distinguishing them as separate — overeating, under-eating, binging, purging — doesn’t work, she said. Over and Undereaters Anonymous operates on the same 12-step program as Alcoholics Anonymous. “It’s all based on the desire to stop and surrender. I binged and purged for 22 years. I joined the program in 2000 and I haven’t binged or purged since,” said Beth, who asked that her last name not be used because anonymity is a principle of the program. Although the concepts and structure are the same in every meeting, there is still a specific meeting for “over and under” eating every Thursday. Specific literature about anorexia and bulimia is available at all meetings. “The majority of people that come to the meetings identify as overeaters, but many of them later come to identify themselves as bulimic because they’ve used laxatives,” said Beth. Over the years the group has tried several times to start a meeting just for young people, but the turnout hasn’t been enough to sustain it. Still, Beth said, students and young adultsregularly attend meetings. Tucson resident Christina Jasberg, 39, has been in recovery from an eating disorder for almost 15 years, but it took her until her mid-20s to seek treatment for the issue. A popular student who was thin, Jasberg’s bulimia came on suddenly. She vividly remembers the first time she made herself vomit, in her senior year of high school after registering for classes at UA. Within a year, Jasberg was hospitalized for fainting. She began seeing a nutritionist, but says she didn’t even try to do the things the doctor told her. “I thought I could keep doing this for the rest of my life,” she said. Jasberg became so desperate, she would seek out novels about people with eating disorders so she wouldn’t feel alone. It wasn’t until she was being treated for depression that she began to address her eating disorder. UA Department of Psychology Professor Barbara Pritchard said there’s a strong correlation between depression and eating disorders. She also said she believes the ideal of being thin that’s come to exist has increased the prevalence of eating disorders in young adults.